Sadly, the journey travelled by the Greek people since 2010 was not some Homeric odyssey, filled with adventure, but rather a living nightmare for millions of Greek people. 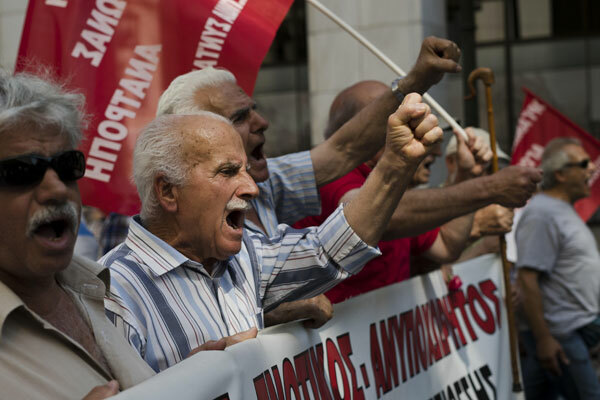 Greek pensioners chant anti-austerity slogans during a protest in central Athens. In particular, Greek workers and their families, as well as small family farmers, have paid a very heavy price at the hands of both the Greek ruling class and their EU overseers in the form of the EU “Program for Greece” (similar to the “Program for Ireland”) imposed on the Greek working class. Both policies were for making the working class pay for the crisis of the system and for them to shoulder the massive corporate debt. The economic crisis provided the pretext for an attack on the advances gained by workers in Europe over many decades. They just dusted off a strategy they had sitting on a shelf waiting the opportune moment to implement it. All the schemes imposed by the European Union, the EU Central Bank and the International Monetary Fund are similar, with the same demands, requiring a similar outcome. Yet they tell us the crises in all these countries are different, and are the product of government failures. How can this be so? The Syriza government in Greece and the EU have portrayed the fact that Greece formally left the EU program at the end of August as a success story for both the Greek government and the EU strategy. Nothing could be further from the truth. But don’t let the truth get in the way of a good bit of propaganda! The Greek economy is now 25 percent smaller than it was in 2010. Greek workers have indeed paid a heavy price. The official unemployment figure stands at 20 percent. One in ten of the population of working age has left the country. Youth unemployment accounts for nearly 40 percent of those left in the country. Average incomes have slumped by a third. Successful state enterprises were bundled up as security for the bail-outs and have either been privatised or abolished. Workers’ wages, terms and conditions have been cut to pieces. The retirement age has been raised by ten years since 2009. The average monthly wage has gone from €1,462 in 2011 to €1,060 in 2018. The wages of low-skilled workers went from €1,080 per month to €747. Many people, especially pensioners, decreased or stopped their daily medicine intake as as a result of “reforms” after 2012. Life expectancy has gone down. The Syriza government and the European Union have hailed the fact that Greece has “officially left the EU bail-out program” as a success. One has to ask, A success for whom? And at what price for workers and their families and communities? Because Greece has officially left the EU-imposed austerity program, does it mean that austerity is over? Far from it. Greece is still burdened with massive socialised corporate debt. Successive governments gave priority to foreign private banks, bailing them out on the backs of working people. In late June 2018 the Greek parliament was obliged to push through another batch of economic changes demanded by creditors, including further reductions in pensions and “reforms” of the health system and taxation. George Papandreou, head of the PASOK government (equivalent to the Labour Party), signed up to the first memorandum with the “troika” of the EU, ECB, and IMF. This first bail-out was to save the zombie European banking system, mainly French and German banks exposed to defaulting Greek debt. As the statistics show, the Greek working class was sacrificed at the behest of the European Union and the Greek ruling class. In other words, they were sacrificed to save a bankrupt economic system. For the bail-outs had nothing to do with alleviating the economic condition of the mass of the Greek people. The second bail-out was to save the failing banking system, that is, to directly save the Greek ruling class. The third bail-out, the one that the left charlatan Tsipras agreed to, was to push through privatisation, welfare cuts, assaults on workers’ rights and “modernisation” of the economy that PASOK could not achieve because of massive resistance by the Greek working class. In stepped the wolf in sheep’s clothing: Syriza, headed by Tsipras. Presenting themselves as friends of the working class, Syriza delivered what the first two agreements could not. While the government was imposing savage cuts in public spending – on schools, hospitals, and pensions – they increased military spending, at the behest of NATO and the EU. Not alone were these policies a savage attack on workers, but democracy and national sovereignty were set aside. EU bureaucrats daily bullied the Greek people, bluntly stating that, to stay in the EU and remain within the euro zone, democracy and the democratic expressions of the people’s will, in the form of elections and referendums, had to be set aside. The ECB banker Lucas Papademos, who became the unelected prime minister in 2011, and the former minister of finance Yannis Stournaras, who became governor of the Greek central bank in 2014, were nothing more than the local branch office of the EU Central Bank. Working people should not understand these events or actions merely as those of a weak and vain leader. It was the weak and compromising response by Greek social democracy, similar to what has been done and is being done by social democratic and labour parties all over Europe. Despite the severe battering of the last decade, the Greek working class has continued to fight back, thanks in no small measure to the resistance, courage and leadership shown by the Communist Party of Greece in its mass mobilisation and the leadership of the All-Workers’ Militant Front (PAME). Here in Ireland, as we approach the tenth anniversary of the bank bail-out, it has to be repeated again and again: the debt imposed upon the Greek, Spanish, Italian, Portuguese and Irish people is simply unsustainable. All the so-called sacrifice has had little or no effect. The rich have got richer and working people are poorer. “Austerity” has worked. It was always for the transfer of wealth from working people upwards to the rich and also outwards to fill the coffers of foreign banks. The Irish people were sacrificed to save the euro. The Greek people may have formally left the memorandum period, but they will still be constrained by quarterly inspections from the EU and ECB to make sure they are still toeing the line. Their budget – like the Irish budget – will go to Berlin and Brussels first before we hear anything about what is in it. Capitalism will be protected at all costs.